Crowns and Bridges: A dental crown goes on top of a back tooth to preserve the function and prevent bacteria from further eroding it. It is more helpful than a filling for teeth that are already badly decayed. Bridges adhere to anchoring teeth in order to hold a single tooth or a few consecutive teeth in place. 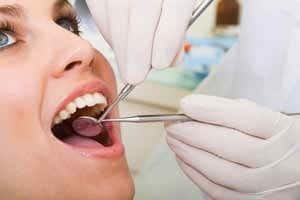 Fillings: If you have a cavity, your dentist removes the diseased portion of your tooth and replaces it with a filling to protect the tooth against further decay. You have the option of selecting ceramic, composite resin, gold or silver amalgam, or porcelain fillings. Implants: Dental implants are a permanent, non-removable solution for tooth loss. Before you receive them, our dentist implants several tiny titanium screws into your jawbone to hold your new teeth in place. Root Canal: When you have an infected or abscessed tooth, it’s necessary to remove the diseased tissue and clean the tooth from the inside. You also receive a dental cap to prevent further infection. Treatment of Periodontal Disease: Periodontal disease, also called gum disease, occurs when plaque builds up over time and hardens. This eventually causes bleeding, swollen gums, and pain. We treat this condition as well as teach you how to prevent it. Now that you understand restorative dentistry, don’t hesitate to schedule a consultation to explore your options further.